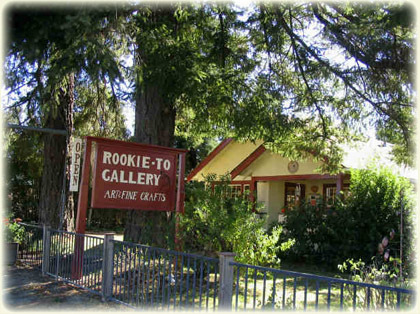 Note the new name for this one-room museum tucked away on a dead end beside the Los Gatos Creek Trail. Among the objects on display are an antique shirt press and iron from the long-gone Gem City French Laundry, and currently you can see as well a Beatles display from a local private collection (the Fab Four were presented the key to the town in 1967). The patio and farmhouse are still here, but now the menu at Corks might offer a spectacular pulled-pork sandwich made from a pig raised right on site and fed restaurant scraps, or maybe eggs Benedict made with bright-orange-yolked eggs that are collected daily from the chickens that patrol the vineyards. Don’t miss the crispy fries tossed with truffle oil, or the strawberry shortcake prepared with crisp housemade biscuits and dense Chantilly cream. Organically-grown wines can be sampled in the Russian River Vineyards tasting room bar that operates now in the entryway. Taste a citrussy Sauvignon Blanc, a rare Old World Charbono, and an uncommon Botrytis Chardonnay dessert wine. Nonni’s Bistro 425 Main St., downtown, (925) 600-0411. Born in Iceland, chef-owner Jon Magnusson has traveled and cooked in kitchens all over the world. He jokes he came to Pleasanton “to get away from my second ex-wife.” Her loss, our gain. The setting is one open room with banquettes along the wall and tables topped with white cloths topped with white butcher paper. Menu items are prepared with care and extremely tasty—salad with house basil dressing, cedar-wood salmon, peppered short rib—but desserts are exceptional—don’t miss the crepes stuffed with fresh ricotta and surrounded with vibrant raspberry and mango sauces. Live jazz and windows that open to the summer air are coming. Hartford Family Winery 8075 Martinelli Rd., (707) 887-8010. Tasting daily 10-4:30. Situated way back from the road, the tasting room here is reached via a scenic drive in over a one-lane bridge and past bucolic vineyards. The claim is they have “a pinot for everybody,” so you might taste an earthy 2007 Far Coast Vineyard Pinot Noir, or if you’re very lucky, a 2008 Arrendell Vineyard Pinot Noir that is served in the White House and quite the treat. Picnic facilities are available, and the $15 tasting fee is waived with a wine purchase. The Farmhouse Inn 7871 River Rd., (800) 464-6642, (707) 887-3300. 18 units. Some wood-burning & gas fireplaces; some saunas & steam rooms. Heated pool (avail. May-Sept); full-service spa. Evening snack; full breakfast; restaurant; limited room service. No pets. The Victorian farmhouse that forms the center of this property dates back to 1872. The inn buildings are on a tamed 6-acre lot, with nearby vineyards stretching for miles. The name evokes patchwork quilts, but it isn’t that kind of farmhouse. It’s an upscale, modern version. After registering, guests get the pleasure of selecting and dishing up some bath salts and a sugar rub, and of slicing off a bar of their favorite soap. This is also where they borrow a DVD and pick up the makings for s’mores (including housemade marshmallows) to feast on later at the fire pit surrounded by Adirondack chairs. Throughout, the inn is stylish and contemporary, with interesting farm antiques displayed here and there. The color palette is subdued whites, greys, and black, and each room is slightly different and has some unusual feature, such as a top-hung sliding barn door to the bathroom or a sliding headboard that allows seeing through to an adjacent fireplace. Two rooms are up a steep staircase in the farmhouse, where alterations are restricted because it is a historical building. Their bathrooms feature an unusual custom-made, two-level, grey soapstone tub that fills from a faucet in the ceiling (! ), a two-person steam shower, and a heated floor. Built in the early 1900s as farm-worker housing, the spacious cottages are equipped today with white-tile bathrooms featuring decorative tile and a jetted tub; some have a full-size dry sauna. The all-new barn rooms sit on the site of the property’s original barn. Rooms in the majestic two-story building have high ceilings, and large windows look out onto large private decks. Mixing lavish and humble, these rooms feature bold architecture accented with homey hand-woven fabrics and simple, elegant furnishings. All 18 units have sumptuous bedding, and everyone gets bottled water and turn-down cookies and milk. Farmhouse, the restaurant, offers two dining rooms and a sophisticated seasonal menu. Diners have a choice of a three- or four-course dinner with optional wine pairings in a pleasing variety of glasses. Options are many, and usually include the popular Rabbit Rabbit Rabbit—featuring rabbit prepared three ways—as well as exceptional fresh fish and beef dishes. A smooth Valrhona chocolate souffle is also a menu mainstay. Breakfast is served here, and on a sunny day the patio is choice. Optionally, an in-room continental breakfast is also possible.